Honeymoon: [<em>huhn-ee-moon</em>] - Noun. A period of blissful harmony. After an early flight the morning following our May 1st, 2010 wedding, the excitement and awe of our picture-perfect day still buzzing in our heads, we could not imagine how this time in our lives could be any more amazing. Sleep deprived, but running on adrenaline, like every newlywed couple that embarks on their first adventure as Mr. and Mrs., we knew that our little slice of bliss was waiting for us just a short hop, skip and jump away. A short, sun-soaked ferry from St. Thomas -- complete with the all-important rum punch -- whisked us away from St. Thomas to a private dock and the entrance of the resort. We were greeted by a friendly smile and a personal cart to take us to Turtle Bay, where we found a virtually private beach and our room. We felt like VIP’s in this posh resort, even though our honeymoon budget didn’t necessarily reflect the service we received. With a little help from a friend and some frequent flyer miles, we were able to embark and find bliss for around $6,000. In the room we found a welcoming king size bed, soothing bathroom and a view that, until now, we had only seen in the movies (Oh, what’s that…no TV? No SportsCenter on this honeymoon? The groom was slightly crushed and the bride had yet another moment of bliss!) We had no phone, no radio, one small clock, and windows open to only the sounds of the water, wildlife and occasional steel drum in the distance. Our senses were on overload -- the scents, the scenes and everything were just amazing. It was more than we expected and we hadn’t even left the room yet! After getting settled in the room, we decided to relax and try to sift through the many activities available to us, both at the resort as well as the adventures all over the island. While planning for our honeymoon, we knew that we could not afford many of the fun options available to us, nor would we have the time to do everything and still relax and enjoy our first few days of marriage. So this is where Traveler’s Joy and our family and friends came into play. It was so easy to research the options -- from massages, to jeep rentals, candlelight dinners and a sailing cruise. We picked our favorites and posted them to the site. Before we knew it, our registry started filling up and we could hear the harmony of the waves in the distance! Traveler’s Joy allowed us to relax and plan our week in paradise exactly how we wanted. To us, the best and most appealing aspect of the island was that there was always something to do, but not so much that you felt like you were missing out if you simply relaxed at the beach for the afternoon. The resort and the island worked in harmony to provide the ideal itinerary. Each day we started with breakfast on a lovely patio that overlooked the water, had great coffee and a cliff notes version of the New York Times to keep us somewhat in touch with reality and giving my new spouse a chance to look at all of the sports scores (he loves his baseball)! To ease into the first day of paradise, we stayed at the resort and spent a day exploring the seven different beaches on the property, plus a little snorkeling. Then, of course, there were the simply delightful fruity drinks they delivered right to our chair – and then a little more snorkeling. On our first adventure day, we hopped into our gifted jeep rental, which was easy to do, since the resort had its own rentals on site. We took off early in the morning, heading up the “highway” (aka, very narrow, twisty, pavement path) and started to explore the island. Note: driving on the left side of the road while looking at the breathtaking scenery can be hazardous to your health! Luckily we had an incident-free day and made several stops at recommended snorkeling spots like Hawksnest Beach, scenic over looks, black-stone beaches and local watering holes like Skinny Legs. Another note for you, May seems to be a great time to visit the island because it’s the start of their offseason. Therefore, we visited several smaller beaches that we had to ourselves to enjoy. Although sometimes the occasional guest, donkey, cow, chicken or giant reptile would interrupt this serenity. One of our other favorite memories that Traveler’s Joy allowed us to enjoy was a romantic couples massage in two small wood cabanas on the resort grounds. Rain started to fall during our time, which only added a beautiful harmony to an already special moment. 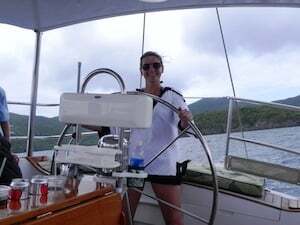 We also enjoyed a half-day sail, where a riveting captain and his wife provided us with many laughs. We got to see underwater sites at our offshore snorkeling spots and listened to insightful commentary on the history and landmarks of St. John and surrounding islands. 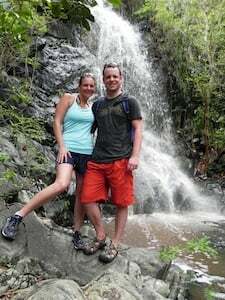 One day we were feeling adventurous and took to the Reef Bay hiking trail. The trail itself was of medium difficulty with several perfect photo ops along the way. We turned off the main trail to head to the petroglyphs and waterfalls. The trail brought us around to a scenic overlook and then directly down to a beach below. Another fun tidbit: we had a taxi drop us off at the start of the trail, and he told us there was a bus stop close to the end of the trail that would bring us back to town and we could catch a taxi back to the resort. However, he forgot to tell us that the bus didn’t exactly run on any set schedule. We learned this lesson after waiting well over one hour before finally being picked up. As our week began to wind down, we decided to take advantage of a beautiful evening by hopping on a sunset dinner cruise which included a wonderful, harmonious band, great photo-ops and more of that rum punch. This truly was an amazing experience, especially watching the water change colors as the sun was setting in the distance. 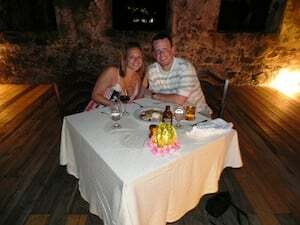 On our final day at the resort we used one last gift that we received from Traveler’s Joy and dined privately in a sugar mill ruin. Now this was the definition of blissful harmony! There was candlelight, amazing food and a romantic scene that you think can only happen in the movies. What an amazing evening. It was truly something that we will never forget. Traveler’s Joy certainly helped us in planning the activities and adventures of our honeymoon, as did the concierge at Caneel Bay. The initial set up and subsequent changes of our Traveler’s Joy site was so easy and stress free. We feel like we got our perfect honeymoon and truly had the best experience we could have ever asked for.